Russet Street Reno: Air Gap?? And that's about all I found. It seems most people do not use one. WI plumbing code requires one, but luckily we are not having an inspector come through. Do you have an air gap? I've never seen one of those. Weird. I'd try to go without! I have never even heard of that! We don't have one and we had our kitchen plumbing inspected. I would think that if one city doesn't think it is necessary then you can probably do with out. never ever heard of that.... nor have i ever noticed one. now i need to keep my eyes peeled. i'm in illinois, and i've never had one. Nope, no idea. Maybe check with the town to see what they say. Anybody near by, neighbors, friends have one? Nope, I don't know anyone with one - I have never even heard of it until now. We just went through the same thing. CA plumbing codes require them but our plumber said they aren't really necessary - but will be needed to pass inspection when/if we try to sell our house in the future. Our solution was to add a hole for one in our quartz countertop and install a soap dispenser for now. We can always switch the soap dispenser for an air gap in the future if we need to. Nope, and there's not one in my parent's kitchen, either. Or in any of the others I can think of off the top of my head. Maybe that's just a holdover from older model dishwashers? I'd say don't mess with it; on the off chance something happens and the normal drain pipe malfunctions it can't be that hard to install after the fact. My parents have one installed in their home, they redid their kitchen about 7 years ago. I think I'm ok to skip it since so many people don't have one! Thanks everyone! Nope, Never seen or heard of it before. They are used in instances where the plumbing isn't vented. It allows air in to get proper drainage. Think about when you open a can of liquid (like condensed milk) you always punch two holes, one for the liquid to come out and one for the air to come in. Otherwise your liquid sort of "blub, blubs" out. That being said, we don't have one because our dishwasher drains into our sink plumbing which is vented. I had one for the first time in a rental a few years. When my husband bought our condo in 2001 it was required to be up to code. Recently I decided we needed a new sink and faucet and the air gap had to go. I asked a few plumbers and thankfully the code had changed since our place was built and it is not longer required. We did have somethings re-piped in our kitchen so we could remove it. The new sink looks so much better without it! I've never heard of them. I've had dishwashers in all my houses, and never had an air gap! I would tell people that it's a button to open your safe room. Uhhh, nope. And I've actually never even heard of that! Apparently they're not required in MN, because we had a plethora of inspectors come through and they didn't say anything about it. Weird! We sort of have one that is a pipe that sits under the sink. (and we had an inspection) I don't see why you need to have it on your countertop. I believe the plumbing inspection should come around the time of the rough plumbing anyway so how would they know it was on your counter or not provided you had the plumbing for it underneath? We have one and all of the sinks we've had (including apartments) have had them. I live in Delaware. I don't think it's that obtrusive and I didn't know it was optional. Oh, air gaps. We remodeled our kitchen in Milwaukee about 5 years ago. 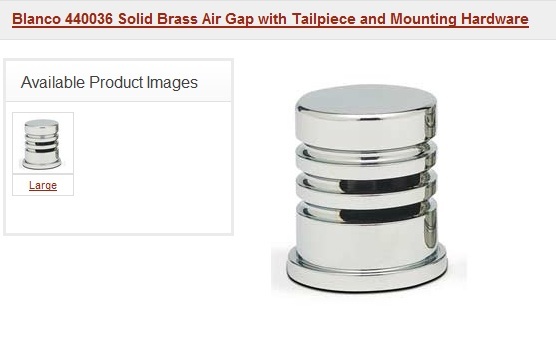 Nobody told me I needed an air gap (we did the work ourselves, so I'm not sure who would have told me!) We never had any backflow problems. Then about a year and a half ago we decided to sell our house. The woman who bought the house from us brought an inspector through and this air gap thing came up. For whatever reason, she latched onto this and made it a requirement that we install one. So for us, it only became a problem when selling our house. That being said, if I were to buy a house again, I would not care if it had an air gap or not. There was some sort of issue in our current kitchen when we remodeled about where the tubes/pipes were running to. I don't think it was an airgap, though, because we don't have one. I haven't even ever heard of that before. Codes are so strange, aren't they? I live in Texas and have one on my home (built in 2004). The neighbor did not and her dishwasher did not fully drain. This also caused water to also settle in the pipe that goes from dishwasher to sink. Settled water = mold :(. It seems there are different ways to install the plumbing (high loop or Johnson Tee)to help create a full suction flow. This would explain why everyone doesn't have an air gap. However, home inspections when selling may be a different story. At least they do offer more sleek options than mine. hmmm....never heard of such a thing. My dad's a plumber and now I'm curious to know if he knows what it is. I live in SE Wisconsin as well. When I had new Silestone counters installed two years ago, the plumber told me that I had to keep the air gap (my home was built in 2003). I found one online that would match the faucet finish. The air gap blends in quite nicely, and I'd rather be safe than sorry! The reason these air gap devices are required in some districts is to prevent dirty sink water from flowing BACK into a dishwasher when the sink drain gets clogged beyond the dishwasher drain attachment location. Picture the trap below the sink getting clogged. Dirty water builds up to the point that it gets to where the dishwasher feeds into the drain line (usually attached to a garbage disposal). The "dirty" water from the sink will hit that drain and flow BACK down into the dishwasher. There are two ways to prevent this - an air gap device (like the one that sits on your sink) which essentially raises the connection point between the sink drain and the dishwasher ABOVE the plane of the sink surface - even if the sink completely fills up with water, it won't back fill into the dishwasher, because the water level in the drain line will never rise high enough. There are other ways to achieve the same result - one is to loop the dishwasher drain pipe as high as possible under the sink. Another is to have a backflow prevention device as part of the dishwasher (I understand many dishwashers have these). 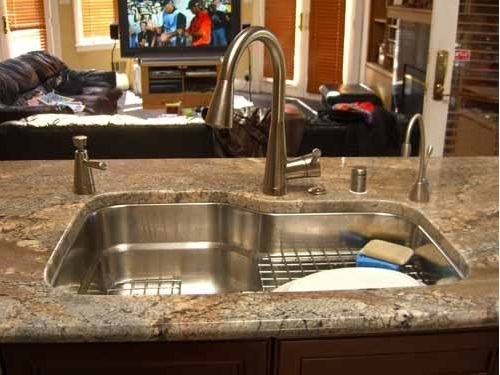 When the dishwasher overflows at the surface of your sink (which can happen), it's because the drain that the water would normally flow down to into is clogged at some point below the dishwasher connection point. While not unusual, the most common fix is just to run the garbage disposal. This is a negative "side-effect" of this type of set up, and backflow prevention devices built into the dishwasher are much preferable, in my opinion, because of the risk of water spilling everywhere. I hope this helps & makes sense! Oh, it's also worth noting that air gaps also prevent a (less common) risk of drain water getting forced BACK into the potable water supply. In new dishwashers, this is virtually impossible because the fill spigot is above the spill ledge in the dishwasher... but in the right scenario (where the drain line gets totally backed up, and the water line loses pressure) there is a small risk. The air gap prevents this from happening. Thanks, Fred. Our plumber explained this to me as well. Always running the disposal before running the dishwasher is a good habit to get into, and he is going to loop that hose as high up as possible. Our dishwasher does not require an air gap, but has instructions for installation without one. Since we didn't have one in our old kitchen, and I don't know anyone here that has one, we are going to go without. Never heard of that , obviously don't have one !!! nah, i've never installed one. just make sure your drain has enough room to flow down properly. i am considering putting a pipe shutoff in a ground floor rental we have that keeps backing up from upper floors. totally different issue, though. hope the pregnancy is going well, by the way! so excited to see the new kitchen developments. An air gap is still a code requirement in Wisconsin, I've had to do one on every reno I've done in the last 10 years! I don't even notice the one at my sink. they are preferable, but not necessary. we have a three hole faucet and a soap dispenser and we didn't want to have yet another hole in our countertop, so we went without an air gap. just bring the hose up as high as it can go in the sink cabinet and then down to the garbage disposal or dishwasher inlet on the drain. the slug of water in the hose between the apex under the sink and the dishwasher helps keep the valve in the dishwasher shut as well, so that's a nice bonus.